Philomene showcases The Children’s House project while she was a CCI student. A few months after Philomène Kouakou returned to Côte d’Ivoire in Spring 2015, The Children’s House, a play and learning space that she created to provide a safe educational and play space for local children in her hometown of Fresno opened. Philomène’s interest in helping young children through education began when she was in high school. 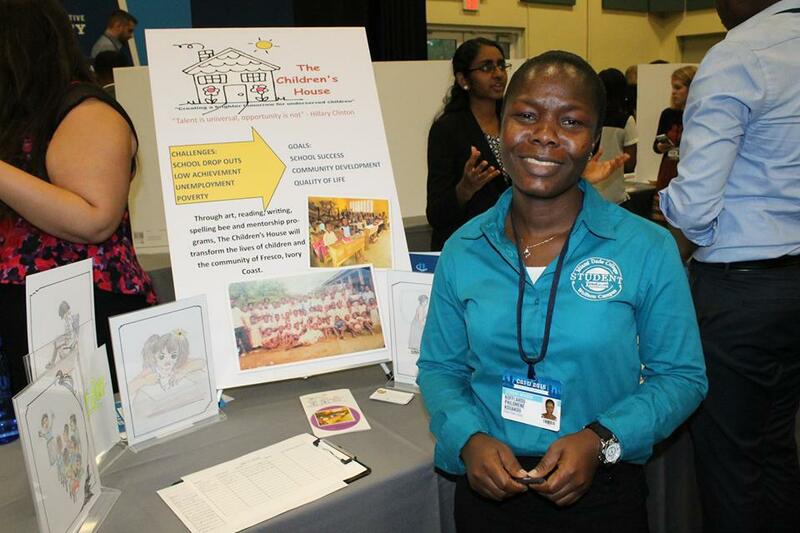 Philomène knew in 2014 when she was accepted in a Community College Initiative (CCI) Program in business management and administration at Miami-Dade College in Florida that she could make her dream of establishing a center for helping needy local children could come true. Working hard, she finished a plan for the center and then took advantage of an opportunity to present her proposal in a competition conducted that provided funding for projects in such areas as education, peace and human rights, poverty alleviation, and public health. By explaining her project with a series of posters and presenting an outline of her proposal, she convinced the officials that her project met its tough criteria and as a result she received funding to help make her children’s community center a reality. Upon returning to Côte d’Ivoire, Philomène needed to establish a venue for the center and set up the space. Fortunately, her project had garnered so much local attention and support that even children from the neighborhood volunteered to help set it up. Together, they repaired and painted walls, readied furniture, and tended to the yard. Meanwhile, Philomène worked to receive a grant for a computer courtyard from the U.S. Embassy and collaborated with UNESCO to stock a new library with books. The once run-down building of The Children’s House now boasted bright purple walls, hand-painted mottos “Dream Big” and “Read!” -- giving children the ability to play and learn at the same time.